Kyle Black discusses what is legally considered a hate crime and the various factors and risks that affect whether or not a hate crime case meets the criteria for compensability. For those who work at Planned Parenthood, there is increased risk of assault and harassment within the workplace, but if employees are attacked are they covered by workers’ compensation? In this episode of Workers Comp Matters, host Alan Pierce talks to Kyle Black about what is legally considered a hate crime and the various factors and risks that affect whether or not a hate crime case meets the criteria for compensability. They also discuss a Pennsylvania statute and the significant difference the varied interpretations, whether “reasons personal” is personal to the assailant or victim, really makes. Kyle Black is an associate in the Pittsburgh office of Lewis Brisbois and a member of the commercial litigation, data privacy & cybersecurity, general liability, and employment & labor practices. 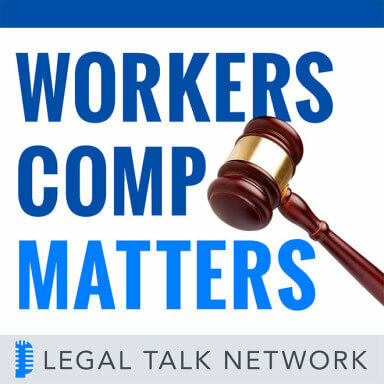 Intro: This is Workers Comp Matters, hosted by attorney Alan S. Pierce, the only Legal Talk Network program that focuses entirely on the people and the law in workers’ compensation cases. Nationally recognized trial attorney, expert, and author Alan S. Pierce is a leader committed to making a difference when workers’ comp matters. Alan Pierce: Welcome to Legal Talk Network and Workers Comp Matters. My name is Alan Pierce. I am an attorney at Pierce, Pierce & Napolitano in Salem, and we are pleased to bring you another edition of Workers Comp Matters with our guest, Kyle Black. Kyle is an associate at Lewis Brisbois Bisgaard & Smith in their Pittsburgh, Pennsylvania office. He concentrates his practice on Commercial Litigation, Data Privacy & Cybersecurity, as well as Workers’ Compensation. Kyle is an editor of the Pennsylvania Bar Association Workers’ Compensation Section Newsletter. He also co-authors with the Honorable Judge David Torrey the workers’ compensation portion of the Tort Trial & Insurance Practice Law Journal’s annual survey issue. And we have invited Kyle here today to talk about a couple of interesting articles he has written for the Pennsylvania Workers’ Comp Newsletter as well as a piece that he authored for the College of Workers Comp Lawyers and the particular piece I am referring to is entitled, Haters Gonna Hate, But Will Workers’ Compensation Pay? An analysis of whether injuries from hate crimes are compensable under workers’ compensation law. Before we get into our topic, we want to thank our sponsor Case Pacer, practice management software dedicated to the busy trial attorney. To learn more, go to HYPERLINK “http://www.casepacer.com” casepacer.com. And also PInow, find a local qualified private investigator in your area anywhere in the United States, visit HYPERLINK “pinow.com” pinow.com to learn more. Kyle, I found your article unfortunately not only interesting but timely. When we think of workers’ compensation we think of people hurting their backs or arms or legs lifting or working with equipment, but as we all know, one of the more interesting aspects of our practice is the fact that what is or may not be covered under workers’ comp is an ever-changing scenario. It varies from jurisdiction to jurisdiction, but we have seen unfortunately a rise in workplace violence, workplace bullying, altercations in the workplace and frankly hate crimes. They are occurring among society at large, but when they occur in the workplace, one might ordinarily think that the victim of a hate crime would be covered in the workers’ comp. So why don’t you take us through the analysis that you have given us in your paper in terms of the general precepts that underlie the workers’ comp system and how those precepts apply to injuries that are as a result of what I guess, for lack of a better term, we will call a hate crime. Kyle Black: Sure. So hate crimes unfortunately aren’t covered a whole lot in workers’ compensation case law. This is presumably because a lot of workers’ comp hate crime related cases typically settle. Most employers usually don’t want to deal with any issues like that, so normally it’s best to get those cases resolved. So with that in mind, there’s not a whole lot of case law providing guidance on how to deal with injuries arising from hate crimes in the workplace. So what I attempted to do is try to provide an analysis to explain how one can look at injuries from hate crimes, how they occur in the workplace. So one of the more fundamental inquiries in workers’ compensation is whether there is a causal connection between the injury that a claimant suffers and the duties or services performed by the injured worker and the issue with hate crimes is determining whether there’s a causal connection between that injury with the hate crime, and workers’ comp in all states recognize injury that arise in the course of employment. So what the article tries to do is explain whether injuries from hate crimes, whether they are considered as arising in the course of a claimant’s employment. Alan Pierce: So let’s just define hate crime. What does that mean in the sense that we are using it here? Kyle Black: Right. So in general you can define a hate crime as any type of harm or even like any threat of harm placed on another person because of their race, their gender, their religion, or even because of their ideology. That would be the typical definition of the hate crime. Alan Pierce: And most of our listeners would know by now that for workers’ comp an injury has to occur out of and in the course of employment. So let’s assume somebody is injured in the workplace by a non-employee, somebody unconnected with the employment, and so it occurs during the scope of employment, during the work day, so to speak, but does it arise out of the employment. So there are different tests are there not to determine if a case meets the criteria for compensability? Kyle Black: Right. So in determining whether an injury arises of a claimant’s employment, it’s important to determine the type of risk of injury that’s involved. And in workers’ compensation there’s generally three recognized categories of risk; there’s professional risk, there’s personal risk, and there’s also a neutral risk of injury. Alan Pierce: Give us an example of a professional risk. Kyle Black: Right. So, professional risk is any type of risk that is inherently occupational in origin. When it comes to an assault, a professional risk of assault, we consider any type of assault that grows out of a work dispute. You take two coworkers fighting or arguing over a poor job performed on a person’s car, that would be considered more of a professional risk of injury. Alan Pierce: How about if somebody works in a health clinic that gives — like Planned Parenthood that deals with pregnancy or abortion or pregnancy prevention and somebody targets an individual in the workplace, might that fall into the category of a professional risk and more likely be covered? Kyle Black: Right. So in that type of a situation, that would most likely be considered more of a professional risk, because in that type of situation you can understand how the work accentuated the risk of an assault occurring. Typically with Planned Parenthood, they obviously deal with abortion and obviously abortion is a very hot topic in the US. So when you have say a crime that occurs at a Planned Parenthood, it is conceivable to see how that type of work at Planned Parenthood could accentuate the arise of a hate crime occurring. Alan Pierce: So let’s assume, for example, that you have got a woman who has a restraining order against her boyfriend and he comes into the workplace and he shoots her and kills her or otherwise injures her, what would that be an example of and is that likely to be compensable or not? Kyle Black: So that’s likely to be considered more of a personal risk of injury and that’s because that type of dispute is more personally related. In other words, it has nothing to do with the young woman’s employment; that simply deals with a domestic matter that will be considered as being imported into the workplace. So in that type of situation that would be considered a personal risk and those are never covered under workers’ compensation. Alan Pierce: All right. One of the things I like to do is twist the facts a little bit. So let’s say we have the same situation, the angry partner or boyfriend comes into the workplace, he wants to continue maybe the verbal altercation he had with his girlfriend or spouse, comes into the workplace, continues arguing and then picks up let’s say the stapler that’s on her desk and hits her with a stapler and injures her. At that point are we coming into an area where the hate crime now bears some — could there be a now a professional risk associated or would this more arise out of the employment? How would you predict a court or an industrial board would treat that twist of facts? Kyle Black: In that case, if you are still dealing with someone’s spouse who is coming into the workplace and if that dispute is dealing with some domestic matter that has nothing to do with the claimant’s work that will still be considered more of a personal risk of injury. Despite the fact that they are taking a work — you can say work related item and using it as a weapon still the assault itself is arising out of some personal related issue. Alan Pierce: Interesting. I am not sure I — I would agree that a lot of jurisdictions would adopt that, but I think this illustrates how technical some of these cases and how fact dependent they are. For me, as a claimant attorney I would be looking for any reason to draw the employment into the risk of injury and if there was an implement that could be used as a weapon, even though it’s a harmless instrument like a stapler or just a piece of hard equipment, I as a claimants’ attorney would be trying to use that over and above the personal animus between the two. So we have discussed personal risk and professional risk, you also identify neutral risk and what is a neutral risk and how does that play into the equation? Kyle Black: So neutral risk is considered any type of risk of harm that’s between say a personal and a private risk of injury. And neutral risks are typically any type of risk of injury that’s from any type of irrational force, some unexplained event or some type of assault by mistake, those would be considered more of a neutral risk of injury. Alan Pierce: Okay. Now, you practice in the Commonwealth of Pennsylvania, and I know you have recently written another article that deals with the particularities of the Pennsylvania Workers’ Compensation Statute and in fact your article is entitled Don’t Take It Personally, explaining the correct interpretation of Pennsylvania’s Workers’ Compensation Act §301(c), the Reasons Personal Exception and why it’s more than just a matter of semantics. Before we take a break why don’t you acquaint our listeners with §301(c) of the Pennsylvania Workers’ Comp Act and how that relates to this topic? Kyle Black: Sure. So Pennsylvania has a very specific statute considered the Personal Animus Exception or the Reasons Personal Exception. And in Pennsylvania, the language in that statute says that injuries arising in the course of employment doesn’t include injuries caused from an act of a third person for reasons personal to him and not directed against him as an employee or because of his employment. The issue in Pennsylvania is that it’s unclear what and who him refers to in that statute. In fact, there have been arguments made that him refers to the assailant, but it is interpreted that as long as the reason for the assault is personal to the assailant, even if the reason for the assault isn’t known to the claimant, that would be considered a personal assault and therefore not covered under Pennsylvania’s Workers’ Compensation Act. So what that paper tries to do is it tries to interpret how one should define him in Pennsylvania’s Reasons Personal Statute. Alan Pierce: All right. And at that point before we take a deeper dive into that topic, we are going to take a short break and we will be back with our guest Kyle Black in just a few moments. Advertiser: Case Pacer is the leading practice management software for today’s workers’ comp and plaintiffs’ attorney. Named one of the fastest growing companies in America by Inc. Magazine, we have given attorneys and their staff the ability to work from anywhere on any device. By automating workflows and streamlining non-revenue generating tasks, Case Pacer enables firms to grow their practice at minimal cost. To see Case Pacer in action, contact us today at HYPERLINK “http://www.casepacer.com/”casepacer.com. Does your law firm need an investigator for a background check, civil investigation or other type of investigation, HYPERLINK “http://www.pinow.com” pinow.com is a one of a kind resource for locating investigators anywhere in the US and worldwide. The professionals listed on PInow understand the legal constraints of an investigation, are up to date on the latest technology, and have extensive experience in many types of investigation, including workers’ compensation and surveillance. Find a prescreened private investigator today, visit HYPERLINK “http://www.pinow.com” www.pinow.com. Alan Pierce: Welcome back to Workers’ Comp Matters, Alan Pierce with my guest Kyle Black talking about Hate Crimes in the Workplace. We left off before the break with a brief introduction to the particularities of the Pennsylvania Workers’ Compensation Statute and the so-called Reasons Personal Exception to coverage under workers’ comp. Kyle, I would like to ask you if you could maybe give us a fact scenario or a case that illustrates the important distinction between whether the Reasons Personal are personal to the aggressors or assailant or should be reasons personal to the injured victim. Kyle Black: Sure. So in 2000 there was a case here in Western Pennsylvania, where there was a man who went on about a two-hour long shooting spree, where he was targeting minorities, and during his shooting spree five individuals were killed and one person in particular was an Asian man who worked at a Chinese restaurant. I should backtrack and say that this man, this assailant, he was specifically targeting minorities in his shooting spree, and he was particularly targeting any type of Asian looking individual. So the assailant ends up killing a man, a Chinese man working at a Chinese restaurant and the man’s family sought workers’ compensation death benefits, but the insurer in that case initially denied the claim, explaining that under Pennsylvania’s Reasons Personal Exception, the reason for that assault was for reasons that were personal to the assailant and therefore it wasn’t covered under the Pennsylvania Workers’ Compensation Act. Ultimately that case ended up settling, but that case demonstrates how one would interpret the statute as saying that as long as the assault was for reasons personal to the assailant, it’s not covered under the Workers’ Compensation Act in Pennsylvania. Alan Pierce: And does Pennsylvania still adhere to that distinction that it has to be personal to the assailant or is that the point of your paper to make the case that it should be personal to the victim? Kyle Black: So that’s the point of my paper is to explain that the reason for the assault needs to be for reasons personal to the victim. Pennsylvania case law recently has been saying that the reason for the assault needs to be for reasons personal to the assailant, but my paper looks at different interpretation of the statute, both within Pennsylvania law, but also in other jurisdictions they have their own Reasons Personal Exception, and I tried to articulate why the reasons for the assault needs to be for reasons that are personal to you, the victim. Alan Pierce: So let’s assume the universal application of the Section 301 was, either it was irrelevant or would require that it be personal to the victim, would it be more likely to be covered? I mean I am thinking again as a claimant attorney if I employ somebody in a business, in this case a Chinese restaurant and somebody with an animus towards people of Chinese descent sees the restaurant, comes in and shoots my waiter, it would seem to me that there would be a sufficient workers’ compensation connection to allow for compensation coverage. Am I hitting the mark or am I missing the mark in Pennsylvania given the current state of the law? Kyle Black: Absolutely, I would agree. You look at that situation and you can see how in that case, and even in the case that I use as an example, you can see how the victim, he has no prior relationship with the assailant, and so it’s hard to fathom that the reason for the assault be for reasons personal to him. In most cases, in most jurisdictions, that would be considered covered in the workers’ compensation. Alan Pierce: Now, you also discuss other factors that go into the general tendency to either find cases under the workers’ comp umbrella or outside the workers’ comp umbrella. So let’s touch on one or two of those. One you mentioned is the humanitarian purpose of workers’ comp, the liberal construction, so to speak, how do you identify that as having a role in this discussion? Kyle Black: The humanitarian purpose of the Workers’ Compensation Act is simply to provide speedy means of benefits for injured workers, and it’s meant to be a means so that workers no longer have to worry about where their relief, where their benefit is going to come from. And when you have a statute that doesn’t allow for benefits because of reasons that are personal to the assailant, it kind of diminishes the humanitarian purpose of the Act, because it denies that victim his need or his entitlement to those workers’ comp benefits. So in order to really effectuate the humanitarian purpose of the Act, the reason for the assault really needs to be reasons that are personal to the assailant in order for — excuse me, it needs to be for reasons personal to the victim in order for it to be excluded from the Pennsylvania or any Workers’ Compensation Act. Alan Pierce: And I know this discussion began and your paper deals primarily with hate crimes, but I can see an analogy to altercations among coworkers, two guys, two women working on an assembly line and they are arguing about each other’s work performance and it escalates and the aggressor or the victim is injured as a result of a work related altercation. I think most jurisdictions would find they would each be entitled to workers’ comp, certainly the victim would. However, if they were arguing over the Patriots and Philadelphia Eagles Super Bowl game and they had a fight on the assembly line that likely wouldn’t be covered. So we are pretty much dealing with the same issues as an outsider coming in and perpetrating a hate crime. In other words, there’s got to be a nexus between the employment and the assault for workers’ comp to apply. Kyle Black: Correct, I think you nailed it right on the head, if you have an assault occurring because of the Philadelphia Eagles, unless you are working for the Eagles, it’s hard to fathom that as being something that’s related to that person’s employment. Alan Pierce: It’s a funny thing that you qualified that. If we were talking about an employee of the Eagles or somehow there was a vested interest in the employment in somehow a discussion of that game or something else. But I think this illustrates how the facts dictate the outcome and if you are defending a case or if you are prosecuting a case, you need to look for those facts that might buttress your reasons for either bringing this under workers’ comp or outside. One case I had that never went anywhere as a workers’ comp case. but I had a woman, mother of a young child had a restraining order against her husband, brought the child to work one day, which was allowed by the employer, at her coffee break she went outside with the child and confronted her estranged husband, who shot and killed them both. And our efforts of trying to make that a workers’ compensation claim basically failed because of what you just identified, that there was no connection to the workplace. I tried to make the argument that it was but for work that the husband knew that she would be at a particular place at a particular time, but that just wasn’t enough, that we needed a connection. Even if he came into the work office itself, I don’t think we would have prevailed; the fact that this occurred on a busy sidewalk in a public street just made it almost impossible. Kyle, any last thoughts before we sign off, I really want to thank you for delving into this topic that hopefully none of us as practitioners will see, but unfortunately is happening, so any final points you would like to leave us with? Kyle Black: No, thank you for having me on. And again, I think just the important thing with workers’ comp to look for is, is there a causal connection between the claimant’s injuries and the duties or services that they are performing. If there’s a way you can’t connect it, then for all intents and purposes, it should be covered under workers’ compensation. Alan Pierce: All right. Well Kyle, thank you very much. I would like to thank you for joining us and for those of you listening, please tune in to our next show and go out and make it a day that matters. Thanks.